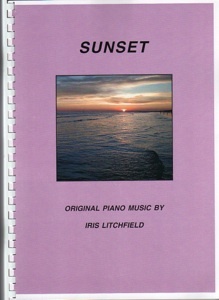 Sunset is a charming collection of solo piano sheet music by British composer/pianist Iris Litchfield. Two of the thirty-two pieces are from her collaborative 2010 CD with guitarist Tom Salvatori, Ever Ever On, and the other pieces are from her European releases (available from Amazon, CD Baby, and iTunes). 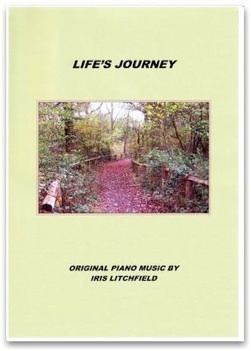 Most of the pieces are in a very light classical style that is strong on melody and expression, conveying a wide variety of emotions and experiences. Most of the pieces are moderate in difficulty, and pianists playing at an upper-intermediate to early-advanced level should have no problems with them. A few of the pieces are fast and lively, but the majority are fairly slow and flowing. I love this book, but must tell you that several of the pieces have spacing issues that can make passages difficult to read. The notes in some areas are too close together to easily be able to read the leger lines or chord changes. The majority of pieces are easy to read, but a few are a bit frustrating. Of course, a nice sharp pencil and some notations of what those notes are will remedy the problem. 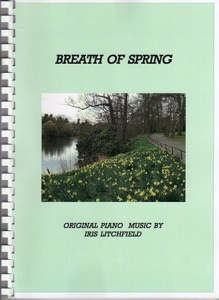 A few of my favorites in this collection are “Fly With The Wind,” “Morning Mist,” “Finding My Way,” “Serenade,” “Winter’s Dream,” “Autumn Days,” and “A Walk In the Heather.” This very enjoyable book is available from Tutti. Recommended!